Arrived right on time in Dublin at 9:50 a.m. Missed a night’s sleep but that’s okay. Arthur settled in quickly to driving our rented vehicle on the other side of the road and dealt well with the roundabouts too. 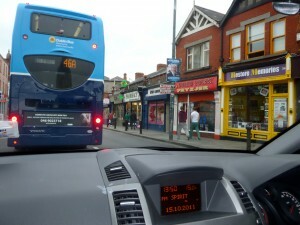 Our GPS was invaluable as we navigated downtown Dublin en route to picking up our rented sound system. We desperately needed to eat and ended up at O’Seas Pub in a sketchy area of town but enjoyed heaping plates of a full course dinner as the Saturday afternoon soccer (football) game was cheered on by the locals. A nap was in order on reaching our hotel and I woke up in time for a 6 p.m. misty evening run in lovely Santry Park out near the airport. Arthur enjoyed his first pint of Guinness so the trip is now officially christened!